But puppetry actually is an ancient tradition of storytelling that is rooted in diverse global cultures. More recently, technical and creative innovations have launched the art to new heights of theatrical expression. The 3rd Chicago International Puppet Theater Festival celebrates this renaissance through Jan. 27. More than 100 performances of 24 shows and events are being given at 19 Chicago venues by professional puppeteers from 11 countries. The 2019 edition of the biennial Festival showcases an entertaining and eclectic array of experiences and cultures from around the world. A wide range of puppet styles and approaches are presented including marionettes, shadow puppets, Bunraku puppets, paper scrolls and even anthropomorphized plastic shopping bags. Some of the productions are lighthearted and family-friendly, while others are dramatic or political. Some incorporate dance, song, multimedia, live music, kites–or total silence. All are thought-provoking and moving examples of the power of puppetry to foster compassion and spark insight into lives beyond our own..
“Pescador/Fishermen” by Silencio Blanco of Chile is a series of quiet portraits of men at sea. Engrossed in their solitary work, fishermen absorb nature’s overwhelming immensity. In “Suspended Animation,” the stunning Huber Marionettes from Cookeville, Tenn., dance, play musical instruments and perform complex acrobatic tricks. “Schweinehund” is inspired by the true story of Pierre Seel, a Frenchman deported to a concentration camp in 1941 on suspicion of homesexuality. Performed on a wooden table, skeletal puppets interact with projected video-animations evoking powerful snapshots of the atrocities Seel endured juxtaposed with wistful memories of yesteryears. It was produced by puppeteers Andy Gaukel of New York and Myriame Larose of Montreal. This year’s schedule also includes the Neighborhood Festival Tour, a series of 12 free performances by Italian and Puerto Rican puppeteers. 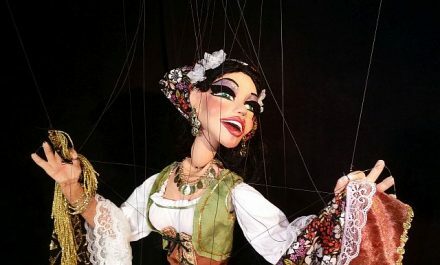 The Chicago International Puppet Theater Festival was formed in 2014 to establish Chicago as a center for the advancement of the art of puppetry. Founder and artistic director Blair Thomas, known for his work in spectacle theater, previously co-founded the now-defunct Redmoon Theater. DETAILS: The Chicago International Puppet Theater Festival runs in various city theaters and venues through Jan. 27. For tickets and a full schedule, visit ChicagoPuppetFest.